The Tesla Model 3 Rear Window Cracking Flaw exists on this particular vehicle. People who own them want to know how we tint them. The Tesla Model 3 is a phenomenal vehicle. It is Tesla's attempt to bring electric vehicles to the mainstream of American society. Tesla is at the forefront of innovation and design which is a good thing. We believe Tesla will be the first automaker to introduce a "Jetson's Style" flying car in the future. Hey, who would've thought electric cars would be so popular in a time when the United States is outproducing Saudi Arabia in oil? Tesla's model 3 has a solid piece of glass for the roof that starts just passed the front seats. The glass is ultra dark on top and then as it nears the rear of the vehicle the glass becomes clear with no color to it at all. While this is an amazing design and adds to the appeal of the vehicle - a whole roof that is essentially a sunroof, it is also a problem. This glass is designed in such a way that the dark area heats up at a different rate as the clear area when exposed to the sun. The glass is also taking the place of a metal roof which is forcing a fragile material (in this case glass) to maintain the structural integrity of the car. This is an ingenious design but it comes with a flaw. The thermal build up on the dark portion of the window, coupled with the structural stress placed on the glass in the roof area is causing thermal fracture without window tinting having been applied. This is a known issue at Tesla and they will warranty glass failure. Again, this is WITHOUT window tinting having been applied. A handful of shops are tinting the entire window by using a 60" roll and forming the film to fit the whole piece of glass. Some are having no problem with this method. Some are reporting that the glass breaks more easily due to the added film increasing the heat to an already weakened structural issue. Uneven heating from the sun as described above, coupled with the flexing and movement of the car applying stress to the glass, creates a perfect recipe for fracture. 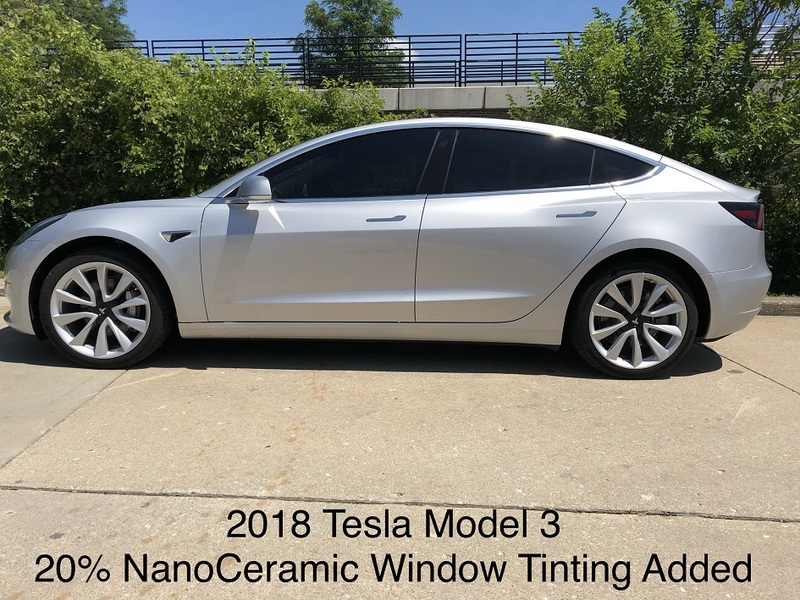 Adding tinting to the dark area actually increases the possibility of breakage because tint applied to dark glass creates even more heat buildup because all types of window tint absorb heat. We have discussed this issue with many tint shop owners from around the country and the consensus is either only tint the clear area up to the dark area, or do not tint it at all. We have explained this in detail to the 15+ Model 3 owners we have worked for. All but one went with our recommendation to tint the clear area only. The other owner opted out of the rear glass completely. Until Tesla redesigns the Model 3 this will continue to be a problem. We believe in thoroughly informing our clients so they can feel good about their decision, whether they do business with us, or another shop.